Okay, did you do it? What is the top result? It should be the product page for Jeff Goins’s ebook on Amazon. In fact, the first entry should be the Kindle version and the second entry should be the paperback version — both on Amazon. The third entry should be the author’s own product page dedicated to this book. So, here’s a question for you: Why do you think Amazon has the top result and not the author’s own product page? Got any guesses? If not, let me explain. The first reason why Amazon dominates the search term for someone else’s book is the age and authority of the site. Amazon has been online since 1995 and has established itself as the go-to place for many products, particularly books. Moreover, millions of transactions over the last 11 years have helped establish Amazon as a site that can be trusted. Jeff is a good guy who’s been killing it for the last five years, but he’s no Amazon. Compare that to the product page on Jeff’s website. 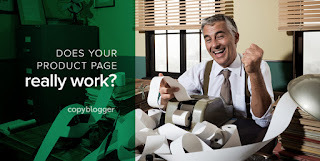 Google interprets all those links to Amazon as a sign that it is the most authoritative page for the search phrase “You Are a Writer (So Start Acting Like One).” Granted, Jeff’s page also drives traffic to the Amazon page. The Amazon page is an invaluable resource for anyone who wants to buy the book. The product description is rich in tantalizing detail, as are the editorial reviews, which are essentially third-party endorsements. The strong customer reviews are user-generated content. Each of these features contribute to keyword-rich copy and build trust with a prospect. While not everyone will read every single line on the page nor sift through every single review (Jeff has 566! ), there is more than enough content to present a clear, accurate product description. Not to mention, the more you tell, the more you raise the perceived value of a product while lowering the prospect’s resistance to buy. Now, pay attention to discover what you can learn from Amazon’s copy to improve your own product pages. About three or four times a year, I get the privilege of participating in one of our Authority Business Coaching calls, where Pamela Wilson, Sonia Simone, and I evaluate people’s businesses, websites, and (sometimes) product pages. In addition, I sit on the review committee for our Certified Content Marketer program, where I critique three pieces of content from an applicant — one of which is a landing page. 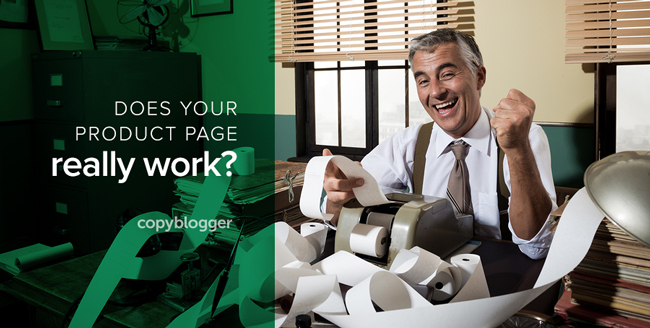 Product pages and landing pages share a lot of the same features. Over time, I’ve seen detrimental patterns among applicants when it comes to landing page copy, which are also problematic for product pages. One such pattern is what I call the “short copy trap.” It can happen in any type of content, but many copywriters make this mistake when writing copy for free opt-in content. In other words, copywriters and content marketers fall into this trap when they believe that “free” is enough to convert a prospect. Our thinking goes something like this: because we understand the value of the headline, introduction copy, three bullet points, and call to action, we assume our visitors have that same knowledge. But when your prospect visits a landing page that’s light on copy, something entirely different happens. Your prospect examines the copy and assumes that if the copy is thin, then the free content is probably thin, too. I’ve also seen this mistake with paid products. Here are two examples we recently evaluated during Authority sessions (both companies gave me permission to use their pages as examples). He’s off to a good start, but his product pages could be improved. Here’s one for a premium mix called Woody Worm – Woodpecker Blend. Mike’s site looks professional and there is a clear image of the product, but you aren’t presented with a reason why you should buy this bird seed over a competitor’s product. All you see are a few sentences on how much your woodpecker is going to enjoy this blend, other types of birds the seed will attract, and the ingredients. Do I just put the seeds out and they attract woodpeckers? What makes this worth $17.88? I’m going to check to see if I can get it cheaper. If I can, why should I pay more? What’s the source of your ingredients? Is there a unique source you use that provides an advantage over the competition? What’s the story behind your blend? Did you get a scientist, ornithologist, or another expert to help you mix it? Who has endorsed this product? Has the blend won any awards? As you can see, this product page offers many opportunities to illustrate why someone would choose Mike’s product over the competition. For the moment, let’s move on to our next example, Middle Mountain Mead. The wine market is glutted, so you have to stand out — particularly if you are selling a $68 bottle of wine. In Middle Mountain Mead’s copy, we get a sense of what it takes to make such a wine and when you could use the wine (celebrations, honeymoons, etc.). Unfortunately, strangers usually don’t care about all the hard work you put into your product … but in this case, the copy tells a story of how this wine evolved. It’s a pretty elaborate maturation process, years in the making. So that’s something special. But why should potential customers care? Why should they choose this $68 mead over a less expensive one? Will it give them prestige? Bragging rights? Help them throw the best parties? Will they feel like they are part of something bigger than themselves? Will they feel like they are trendsetters? That they are making history? Will the mead take them to a new dimension of intoxication? Ultimately, it comes down to this: Why should we buy wine from this company and not another one? Later in this article, I’ll summarize how to write product pages that produce the results you want. Next, however, I’m going to focus on one of the most powerful features of effective selling on product pages: stories. And I’m going to start by talking about another wine merchant. Jon Rimmerman is the founder of Garagiste, the world’s largest email-based wine business. That line should cause you to pause. You can sell wine through email? Indeed. Keep in mind, he hasn’t advertised since 1996. So, what is Rimmerman’s secret? He is the author of one of the most popular email newsletters on wine. In the latest numbers I could find from 2012, he boasted an email subscriber list of 136,000 and annual sales of $30 million. I’m sure his subscriber numbers and sales have grown since then. And let me be clear on this. Rimmerman sells cases of wine through an email newsletter. Once he procures a new stock, he sits down, writes an email, and hits send. In this case, his emails are product pages. You purchase through a link to his website. And he never fails to move all the cases. Even at several hundred dollars a case. What makes his emails so great? His meandering missives are part salesmanship in print, part trivia junk-drawer on topics like vintage 1960s tube amplifiers or 100k bike rides in the high-hills of France (after two bottles of Beaujolais). Then there are the stories. It makes for compelling reading (and compelling wine). Rimmerman sees his purpose as the intermediary for wine visionaries. Rimmerman feels many wines can be good, even great. But not all wines can boast a history that involves cats, illegal drug production, an EPA agent, and the monk-like dedication to winemaking. That’s the difference, which unfolds through Rimmerman’s stories. But just in case I haven’t convinced you of the power of stories to increase the value of a product and actually sell it, let me take you on another journey. Journalist Rob Walker and writer Joshua Glenn bought cheap trinkets at thrift stores and garage sales. Then they paired each object with a writer (such as Jonathan Letham or Nicholson Baker) who wrote a fictional story about the object. A photo of the trinket and the story were then published on eBay. My granddad’s granddad had a box under his bed. If you got to open the box (you had to beg) you would find a little door. The little door had a combination on it that you had to know to get inside the second box, which I did. I had the combination tattooed on my spinemeat when I was four while on a trip to see the circus. The tattoo was free. My granddad’s granddad was very powerful and rich. This mundane item was originally bought for 99 cents and sold on eBay for $59.00. A silly story increased its value by $58.00. Here’s how some of the other items fared. Why were people bidding on these insignificant objects on eBay? The stories you include on your product page don’t have to be linear like Jon Rimmerman’s. You can tell one story in the product description and tell several other stories through testimonials. You can tell a story through photographs of the product, like Saddleback Leather (one of Sonia’s favorite places to shop) did for their classic briefcase. And notice the customer photographs. You can tell a story about a unique product-creation process. Each fountain pen in this series by Goulet is hand-torched to get a distinctive look. In other words, each pen is one of a kind. Now let’s summarize how to create a product page that produces results. Noteworthy age and authority (both the website and the page). This is why it’s important to launch your site as soon as possible. The longer it is online, the more trust it earns. A growing list of links pointing to the page. One of the best ways to encourage people to link to a product page is through an affiliate program. But if that’s not your cup of tea, then build a product and page that becomes a resource people want to share with others. Each link is another way to drive traffic to your product page. Keyword-rich copy. As I’ve said before, the more you tell, the more you sell. And all of this content doesn’t have to come from you. You can publish great stories with relevant keywords through testimonials and reviews. A variety of photographs. Encourage customers to share their own photographs to continue the tradition of storytelling through pictures. A video demonstrating the product’s benefits. You could even interview customers. And don’t forget the transcript! It satisfies those who prefer to read and provides more keyword-rich copy. These essentials are part of winning product pages whether you sell physical objects, services (consulting), or digital products like software, online courses, or ebooks. We covered a lot of material today, so let me know if you have any questions. Just drop a note in the comments section below. And while you’re at it, share your favorite product pages. I’d love to hear from you!